The Johannesburg HOMEMAKERS Expo was held at the Ticketpro Dome from 28 February – 3 March. Find out about the experts, celebrities and guests who were there, who won the coveted exhibitor award and when the next exhibition is happening. Find out more about Tuis|Home Theatre Here. 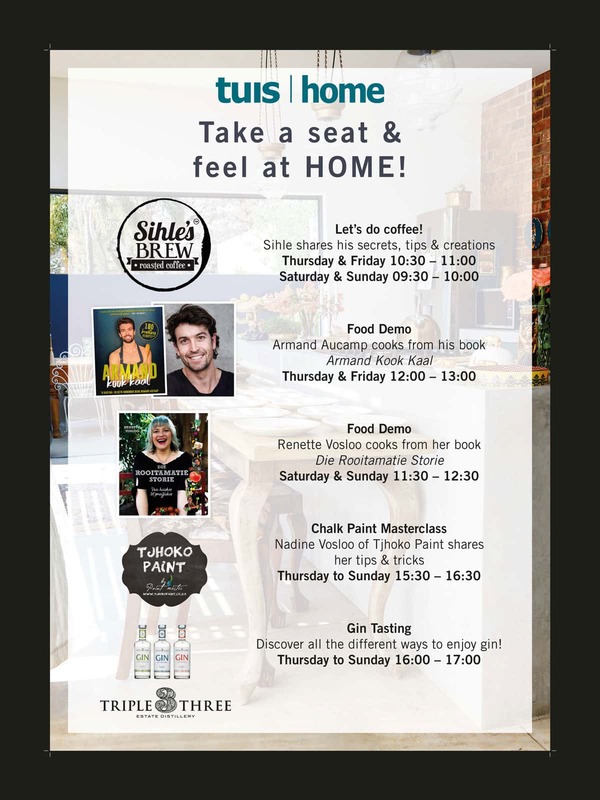 Buy your tickets for Johannesburg HOMEMAKERS Expo here. Celebrity Chef and Actor, Armand Aucamp will be cooking up a storm in the Tuis|Home Theatre at Johannesburg HOMEMAKERS Expo…. Don’t miss these demonstrations at the Raw Workshop. Buy tickets to Johannesburg HOMEMAKERS Expo here. Patio Warehouse is one of the leading suppliers of luxurious and comfortable patio furniture and accessories, including trendy hanging chairs.